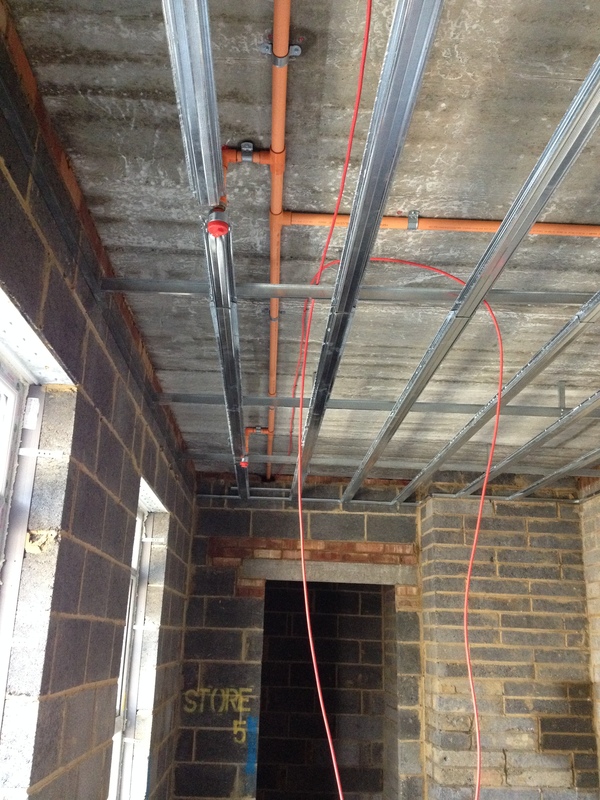 Triangle Fire Systems are currently installing the fire sprinkler system at Howard’s Lodge Care Home in Brentwood. 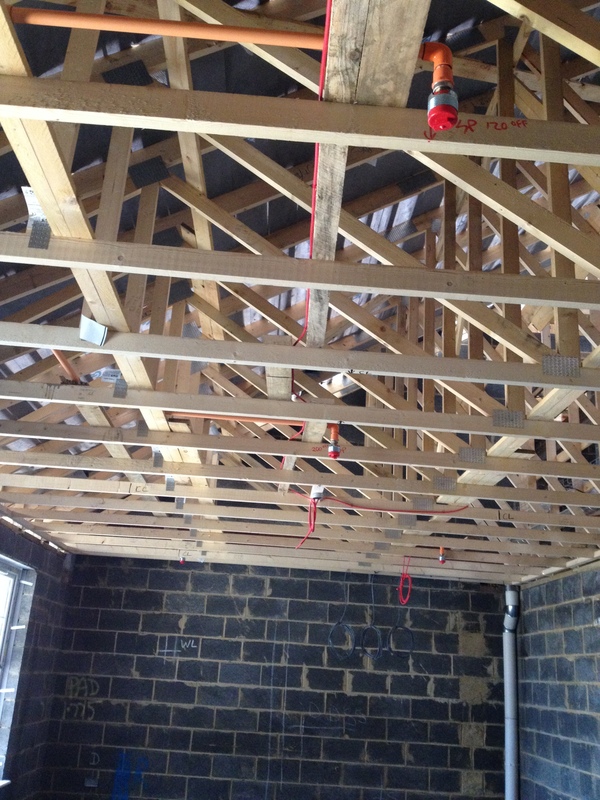 Baxter and King are the main contractor on site, and we are working in conjunction with Heatcare. The St Michael’s Homes £4m expansion project will see the care home increase from 20 to 64 bedrooms. The new Howard’s Lodge will provide flexible care to include quality nursing, residential & dementia care in separately designed wings so adapting to changing residents care needs. Triangle will be providing full sprinkler protection to all habitable rooms, all 283 sprinkler heads will be VK457 residential concealed sprinklers with white cover plates. 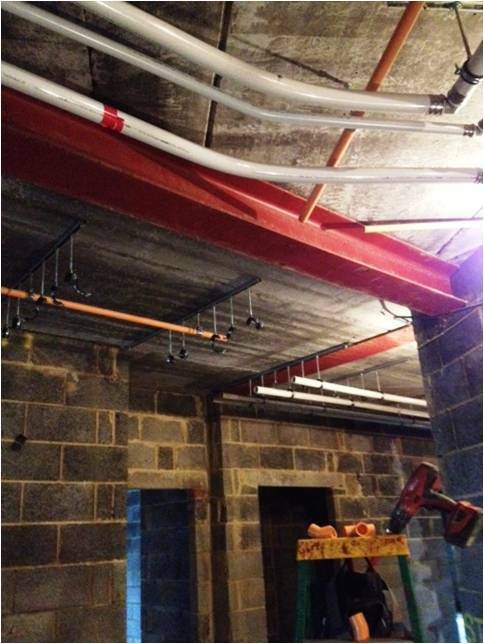 The sprinkler system will utilise the cold water boosted supply, a value engineered approach which is the most effective solution for a building of this nature. The building’s fire alarm system will be connected to the flow switch on the sprinkler control set and this will sound the fire alarm on activation of the sprinkler system. At first fix the engineers will mark the locations for the sprinkler heads, install the network of pipes and pressure test. On arrival: ground floor, main corridor run. 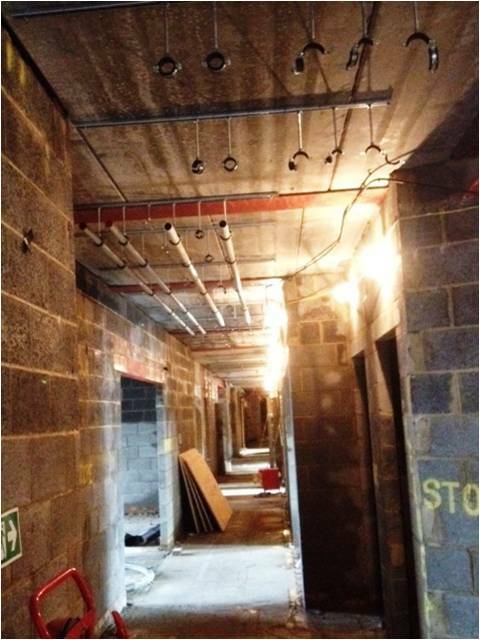 Installation of sprinkler pipework to corridor. 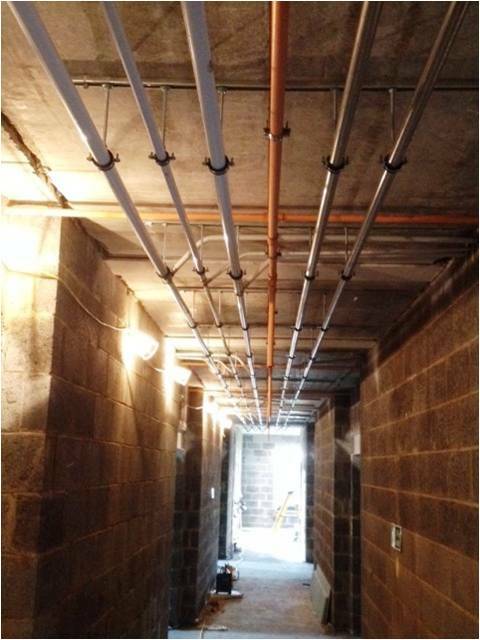 Completion of pipework to specific corridor zone. 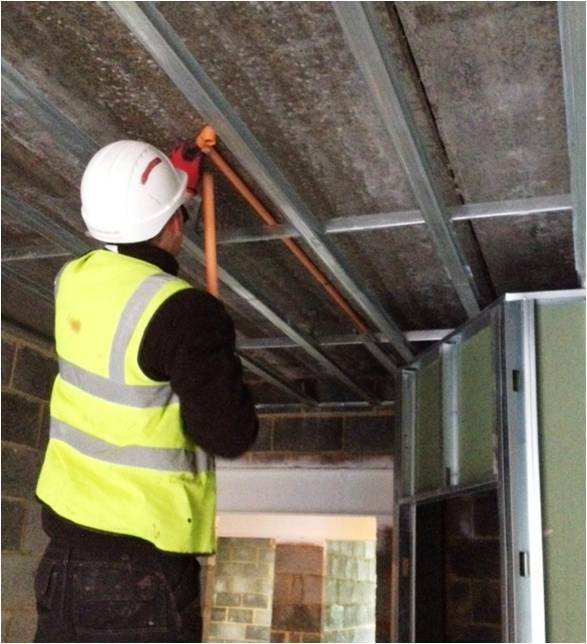 Triangle Engineer, installing pipe work to bedroom. At second fix the engineers install the sprinkler heads and pressure test. 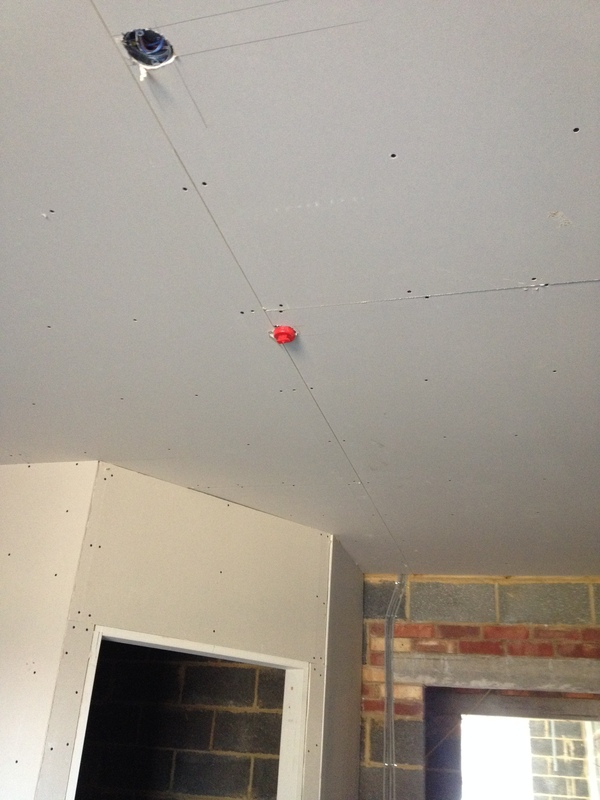 Sprinkler head fitted to timber joist. Sprinkler head fitted to metal frame. Boards are up. Heads flush to ceiling. The care home is currently on schedule for its grand opening in Mid July.